The rapid construction of landmarks is hoped to restore the capital, but residents believe its rushed results are tacky and resources would have been better used improving city infrastructure. Winston Churchill is flashing his trademark victory sign from the rooftop of Macedonia’s shining white new foreign ministry building. The center of the construction controversy is a monument in the town square that resembles Alexander the Great. Photo by Prince Roy. Alexander the Great is pointing his mighty sword from the top of a mega water fountain that airs classical music on the hour, as sprinkling water dances to the sound of its tunes. Alexander’s father, Philip II, is standing firmly on a tall marble pedestal, his fist lifted toward the sky, surrounded by drab communist-style apartment blocks and garbage littering the streets of Macedonia’s capital. All those grandiose buildings, monuments, fountains and bridges — some completed, others under construction — are dotting the city center as part of a government project called Skopje 2014, officially intended to rebuild a city that lost many of its landmarks in a 1963 earthquake. One of Europe’s biggest urban endeavors has been criticized by many Macedonians who describe it as kitsch aimed at distracting the general public from the small Balkan country’s problems — such as a devastated economy and unemployment that hovers around 30 percent. The project which started in 2008 generated controversy for the construction costs of some 20 new buildings and as many as 40 monuments — estimated to range between €80 million ($104 million) to €500 million ($650 million) depending on the government or unofficial figures. It has also split local residents, some saying the money could have been spent more wisely on the construction of new apartment buildings, factories or roads, and others claiming the project is a matter of national pride. The tension over the venture reached its height in March 2009 when a group of Skopje’s architecture university students tried to protest peacefully against the project, and were beaten by nationalist party activists in the presence of the police and media. The centerpiece of the construction bonanza is the 28-meter (92-foot) tall bronze equestrian colossus called “Warrior on a Horse” — a monument that bears an uncanny resemblance to Alexander the Great, the ancient hero of Greece. Officials were careful not to name it outright after Alexander the Great because Macedonia and Greece have been locked in a 21-year dispute over the right to claim the region’s ancient heritage. Greece says its northern neighbor is falsely laying claim to its name, history and ancient heritage and has blocked Macedonia’s accession to the European Union and NATO. Macedonians, however, claim they have the same right as Greeks to call themselves descendants of Alexander, arguing that Macedonia in ancient times was one geographical territory, and its heroes now belong to everyone living in the separate states. 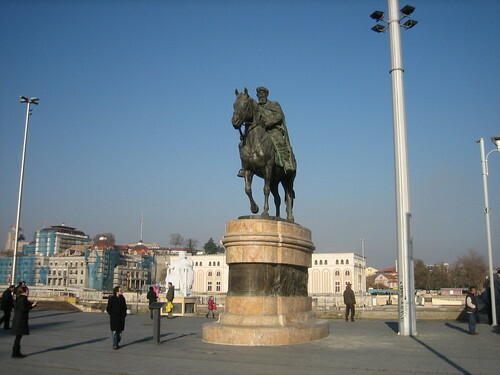 One of the main symbols of the project is Porta Macedonia, a triumphal arch situated near the main Macedonia square. The 21-meter-tall (70 foot) arch is meant to commemorate the long struggle for Macedonian independence — the country became independent of Yugoslavia in 1991 — and 32 reliefs carved on the outside depict events from centuries of earlier history and struggles. Among the many monumental buildings under construction on the banks of the Vardar river dividing the city are a new archaeology museum, a dome-shaped cylindrical financial police headquarters and communications ministry — all in different neo-classical and baroque styles. The new ornate foreign ministry building has dozens of statues of late foreign dignitaries standing on its roof edge, including Churchill and American presidents George Washington and Abraham Lincoln. Two pedestrian bridges over the river, a dozen meters (yards) between each other, are being completed. One is the Art Bridge that includes 29 bronze sculptures of known Macedonian painters, writers, composers and musicians. Besides Alexander the Great, his father, Philip II, and his mother, Olimpias of Epirus, monuments of other notable historical figures linked to Macedonian history are newly present in the city of some 470,000 people, including Mother Teresa, the late Nobel Prize winner for her Catholic charity work who was born in Skopje.